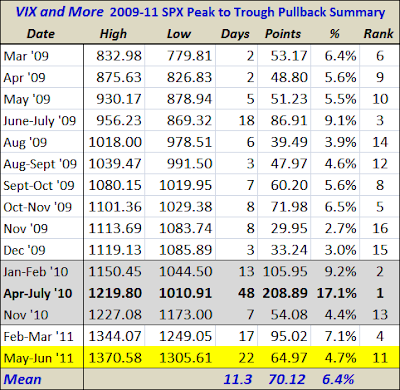 This data from the blog VIX and More is a day old, but it highlights an interesting situation. Of the 16 pullbacks since the March 2009 "generational bottom", the current episode is the 2nd longest at 23 days, trailing only the 48 days experienced last April-June as QE1 ended and the flash crash hit. But that said, as of yesterday it was only the 11th most severe with a 4.7% loss on the S&P 500 (obviously a bit higher today). Which is why this has not been an easy pullback even for bears who target the indexes - it's been a long slow grind with a lot of spring back rallies, and a rotation into defensive sectors which has offset the brash selloffs in 'beta'. The chart also shows how dark of a period this has been for shorts - the 'pullbacks' the past few years - while occasionally sharp, are so quick in duration most of the time (2-8 days) by the time you position for them, the market is already starting a new V shaped bounce!